Hundreds of people in the Mid-Atlantic and New England reported they looked up on Tuesday night and saw a meteor hurtling through the skies. The meteor soared over the D.C. area about 11 p.m., and the brilliant shine caught a lot of eyes. Steve Chazin was driving from Virginia's Dulles Airport on Route 50 when his dashcam caught the sight: an illuminated orb flying through the skies, surrounded by a glow and backed by a tail. The American Meteor Society had 360 reports of the celestial event pour in from Washington, D.C., and 11 states, including Maryland, Virginia and West Virginia. That group called the flare a fireball, or extra-bright meteor, meaning it shone brighter than Venus. According to the society, the fireball traveled from north to south and plunged into the Atlantic Ocean in front of Bethany Beach, Delaware. Witnesses wrote to the American Meteor Society's report line about their rare chance to see such a stunning sight. Many reports said the meteor appeared green. "It was the brightest meteor I have ever seen," one reporter wrote. "It was so beautiful I'm so happy I got to see it," Emily M. wrote in her report. Meteors hurtle into the earth's atmosphere at speeds around 110,000 mph, Storm Team4 Meteorologist Lauryn Ricketts says. Only about a quarter have trains, or ionized gas trails that make a visible tail. The American Meteor Society says several thousand meteors appear in the Earth's atmosphere each day and many of them occur over the oceans and uninhabited regions and are masked by daylight. The meteor comes as the annual Lyrids shower, which runs from April 14 to April 28. Although this meteor was likely not part of the Lyrids, you'll soon have a good chance to see more meteors fly by at night. Cloudy skies will obscure the view through the weekend, but things should clear around the time when the Lyrids shower peaks, from April 22 to predawn on April 23. You can see 10-20 meteors an hour during the peak if you're in a dark spot with limited light pollution. You'd be lucky to see something as bright as Tuesday's meteor, especially since the moon will be nearing full in a waning gibbous stage. 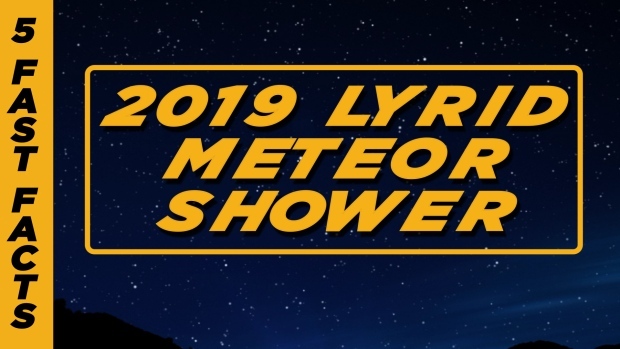 The Lyrids shower is an annual occurrence that comes as the earth passes through the tail of Comet Thatcher and has been recorded and observed since 678 BC — making it the oldest known meteor shower, Ricketts says.